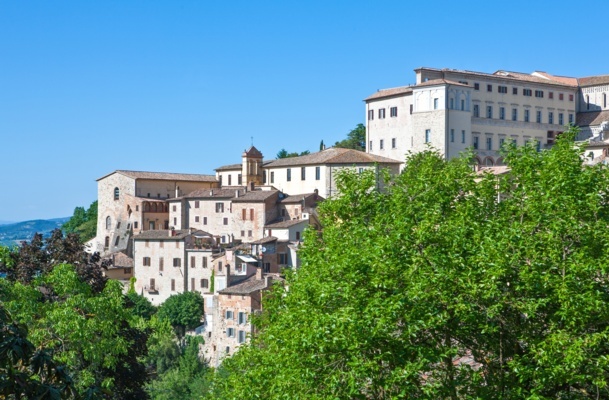 Whilst essentially rural, Umbria boasts important, historical centres to rival many in Italy. Perugia, its medieval capital, is noted worldwide for its magnificent architecture and has one of Italy's finest piazzas. Gubbio, dating back to Roman times, is a town rich in history – make your way to the Basilica Sant'Ubaldo at the very top of the town and you will be rewarded with a glorious panorama of the Apennine mountains. Not to be missed is Assisi, a stirring sight as you approach across the plain. The wonderful Basilica, in honour of St Francis, attracts pilgrims from all over the world. The town rests on the side of Monte Subásio, part of the Apennine range. This protected territory of outstanding natural beauty, with its wealth of flora and fauna, is a paradise for nature lovers and walkers. Finally, do not miss a visit to Lago di Trasimeno, the vast lake at the heart of this landlocked region. Take a boat trip out to one of the islands in the lake, hire a bike and cycle around it, pause for a snooze at one of the lake beaches, or simply enjoy a gelato on the waterfront. Umbrian cuisine is hearty and simple with its own specialities demanding to be tasted. Around Lake Trasimeno, restaurants offer fresh carp from the lake, or ‘tegamaccio’, a rich eel and perch stew cooked in herbs and white wine. Porchetta (pork cooked over a wood fire stuffed with minced liver, pepper, garlic and wild fennel) is a speciality served throughout Umbria. Black and white truffles are often used to flavour pasta and risotto. And olives are a key ingredient in the local cuisine, evidenced by the groves of olive trees seen throughout the region. The most famous Umbrian wine is the Orvieto Classico, a dry white wine which, it has been said, was used as payment to architects working on the Duomo in Orvieto. Try, too, the vintage red wines from around Montefalco and Torgiano. There is plenty going on in Umbria throughout the summer, from village events to celebrate the 'vendemmia' (grape harvest) to renowned music festivals such as the Umbria Jazz Festival in Perugia. Whatever the event, music, fireworks, food and wine will play an important part! Gubbio hosts two fun events in May; the ‘Ceri’ race and the ‘Palio della Balestra’, where competitors in historical costume use medieval fixed crossbows. Then in June, Spello’s streets are covered in flower artworks, whilst Anghiari re-enacts the Battle of Anghiari in 1440. In July, a water version of the Palio takes place on and around Lake Trasimeno, with boats instead of horses. Just one of many events in August is the ‘Palio dei Terzieri’ Renaissance festival to Città della Pieve. September brings the ‘Giostra della Quintana’ to Foligno, where the districts of the town compete on horseback, and chocolate lovers should definitely visit the annual ‘Eurochocolate’ exhibition in Perugia in October. Spring is a wonderful time in Umbria when wild flowers carpet the meadows and the days become gradually warmer and longer. Summer is generally hot and sunny, often extending into September. Towards the end of September and into October, the air becomes crisper with the onset of autumn. 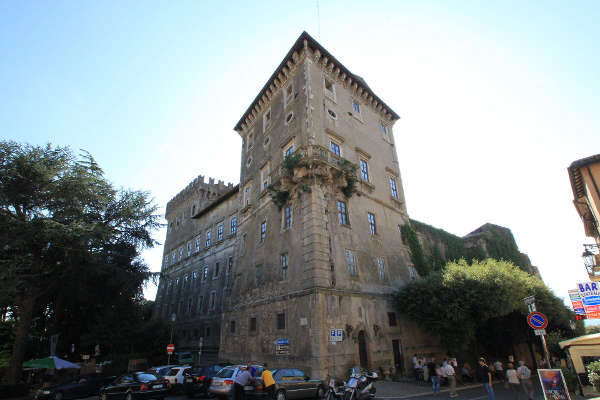 For our Umbria properties, the airport at Perugia is served by Ryanair and the Rome airports of Fiumicino and Ciampino are also worth considering. Paciano is one of ‘I Borghi più belli d’Italia’ (The Most Beautiful Borghi of Italy) and justifiably so. Sitting on the olive tree covered slopes surrounding Lake Trasimeno, this medieval village retains its old world charm: three arched gateways in the village walls lead to narrow streets and the main square surround by centuries old buildings. Two restaurants and a number of amenities ensures it still bustles with life. It is thought that the name derives from ‘Pagus Dianus’, which means ‘bright village, in a good position’. An apt description as from Paciano, you can easily reach not only many of Umbria’s towns for a day out but also much of southern Tuscany. The Val d’Orcia is quintessential Tuscany with its rolling hills and cypress trees, and the stunning towns of Montepulciano and Pienza. 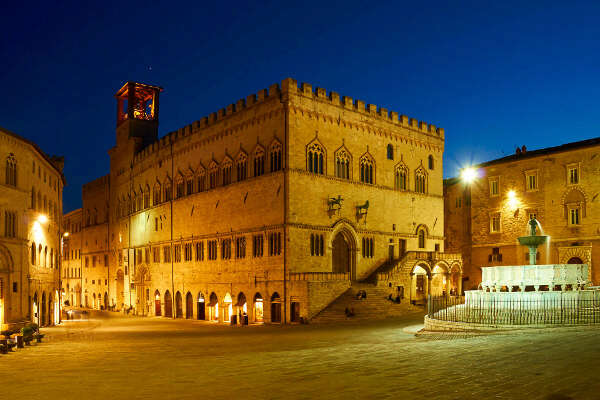 The regional capital, Perugia is one of Umbria’s best preserved medieval hill towns. A beautiful and elegant place, it teems with history, architecture and art, yet at the same time is a vibrant modern city with plenty of events throughout the year. The focal point and social hub of the historic centre is the Piazza IV Novembre, an impressive square dominated by the splendid Palazzo dei Priori and the San Lorenzo Cathedral. 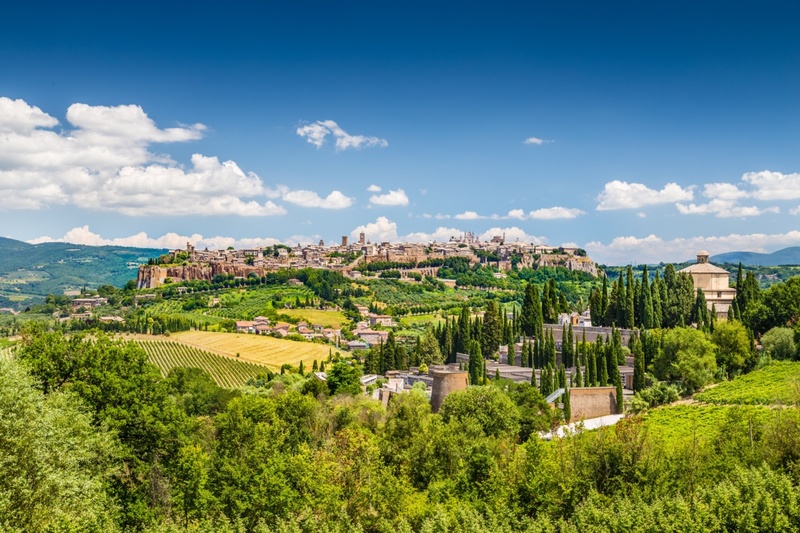 A whole host of churches and chapels, palazzi, a 13th century aqueduct, and the Botanical Gardens also await discovery, and an amazing view of Monte Subasio and Assisi unfolds from the Loggia dei Lanari terrace. Surrounded by oak and chestnut woods and farmland, Preggio’s hilltop position affords wonderful views of the Niccone Valley. 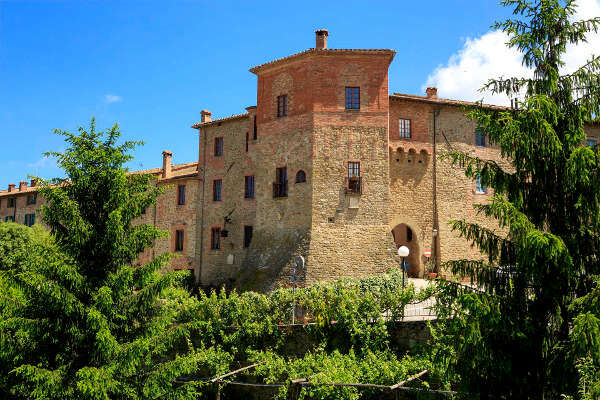 It lies in a sleepy rural area not far from beautiful Lake Trasimeno, the bustling picture-postcard town of Cortona and the historic city of Perugia. Although a small village of only around 120 residents, it attracts a large number of visitors during its yearly sacred music festival, and the Chestnut Festival in October, when food and other farm produce is sold from ancient cellars converted into rustic shops for the occasion. The pretty little town of Deruta, situated about 15km from Perugia, has been known since the 16th century for its ‘majolica’, ceramics characterised by a colour scheme of verdigris, cobalt blue and orange. 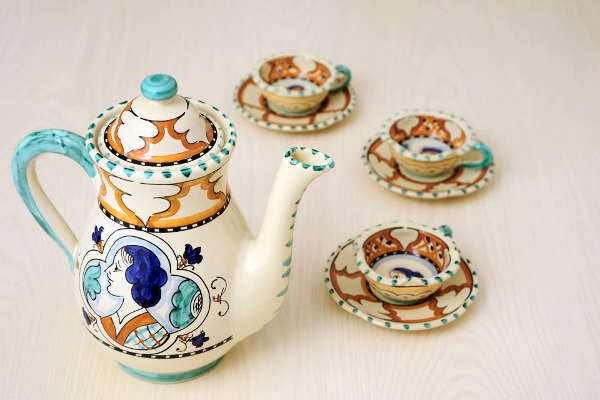 Learn about this local industry at the ceramics museum in the Convent of St Francis, and visit the Church of Madonna dei Bagni to admire the decorated ceramic walls. There are still many workshops and shops here producing and selling majolica ware, which could make a lovely souvenir or gift. Much of the production is carried out as a cottage industry, the clay shaped and hand-painted by craftsmen, but taken to a large scale kiln for firing and glazing. This can mean the artistic quality of the decoration varies, so it is worthwhile visiting many shops to compare similar items before buying. Keeping guard over the valley below from as early as 1191, Giove’s impressive castle is the first sight to greet visitors to this small medieval village. Towering five storeys high it has 365 windows, one for each day of the year, and hides a labyrinth of terraces, courtyards and secret passages behind its imposing walls. Inside, the rooms are adorned with exquisite mythological paintings by the 16th century masters Domenichino and Paolo Veronese, testament to the prestige of the families that have called the castle home. With a scattering of shops and restaurants welcoming visitors and locals alike, a spot not to be missed is the alfresco café kiosk which sits beside the castle, its terrace offering a panoramic view that takes one’s breath away. 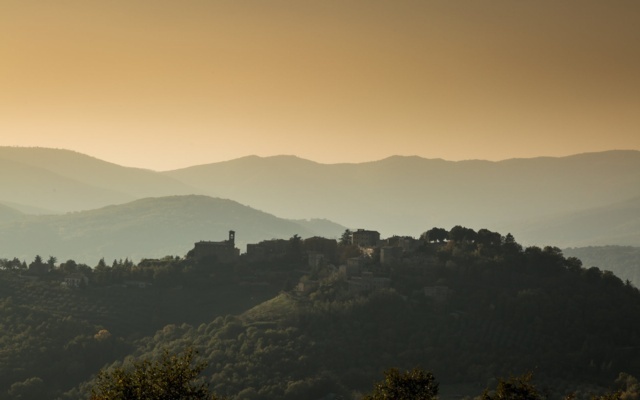 Todi was once voted the ‘città ideale’, or the most perfect place to live, by a group of researchers. As you make your way up the winding road to the top where Todi is perched overlooking the Tiber valley, you can easily see why. It is a charming place with a real sense of history, emphasised by the three concentric walls from different eras – Etruscan, Roman and medieval – that encircle the town. Entering through the gates you arrive at a beautiful square, Piazza del Popolo, surrounded by medieval ‘palazzi’. Narrow streets lead off the square, lined with shops, cafes and restaurants. All in all, maybe the ideal town?